A Gulfarium staff member carefully opened the plastic container, lifting a flapping Green Turtle into the morning sunlight along the Emerald Coast. Walking quickly, but carefully, she made her away across the beach sand and straight into the waves of the Gulf of Mexico. Within seconds, the Green Turtle had slipped beneath the surface, disappearing from the view of those who had cared for its injuries for weeks. One down, three to go! The four sea turtles released in early September had all been injured in July. Celery and Sprout – the two juvenile Green Sea Turtles – were accidentally caught by hooks on local fishing piers, as was Sally, a subadult Loggerhead. Finally, Mariner, another subadult Loggerhead, was rescued after people spotted her with netting cutting into her left front flipper. 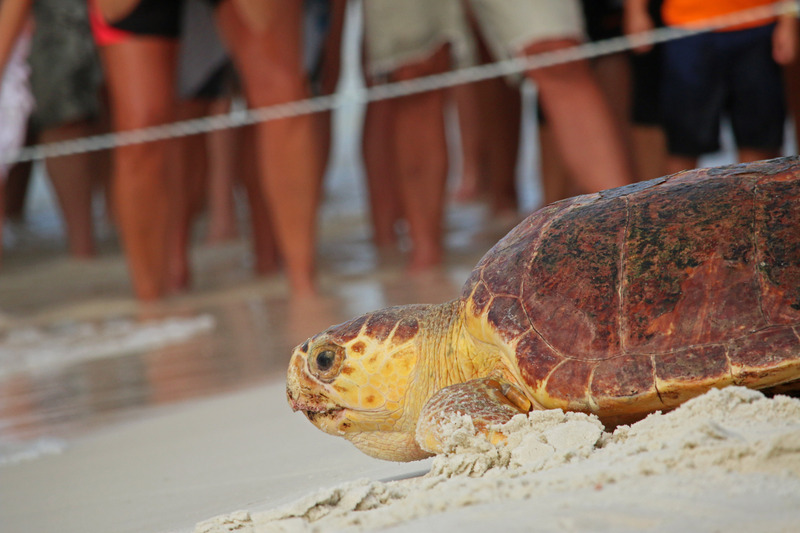 All were cared for and released by the Gulfarium C.A.R.E. Center. The turtle releases are a direct result of their commitment to rehabilitation, but also their efforts in environmental education. The beach was full that morning, visitors and locals standing behind rope and ticker tape as they awaited the sea turtles. Kids formed the bulk of the front row, many of whom had never seen wild turtles before. 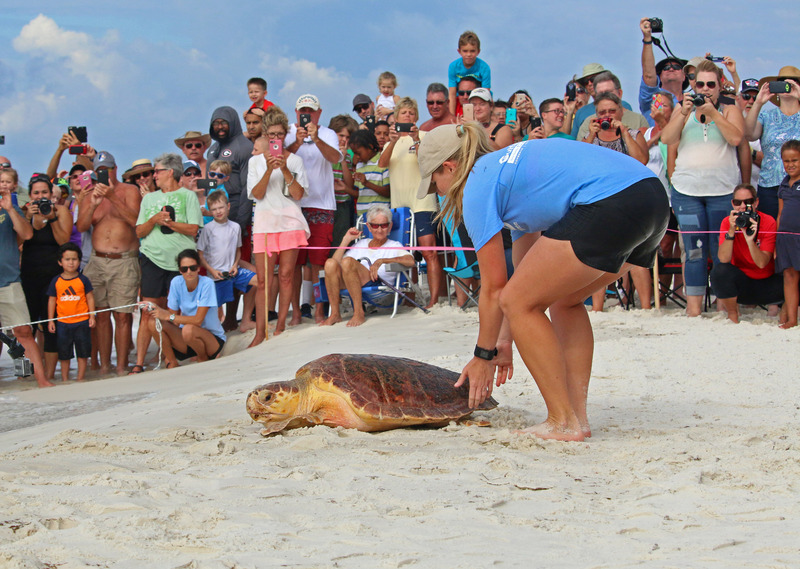 Before and after the releases, children and adults alike asked Gulfarium staff questions, coming away with an enhanced appreciation for the marine world. The two Loggerhead turtles went last. Unlike the Greens – that were small enough to carry – the Loggerheads were so heavy that multiple people worked together to lift them, one by one, from plastic tubs out onto the sand. The first went straight for the surf, gone in moments. The very last turtle waited for a breath, acclimating to her new, but familiar surroundings before moving powerful flippers towards the Gulf. All four turtles are still young, and could have decades of swimming ahead of them. I certainly hope so!